This is the code originally written for Darkwater years ago in order to pull real-time weather conditions around Forks, Washington. Since then I've tweaked it, its source changed from Yahoo to Weather Underground, and given installation instructions that should make it a lot more accessible. Please use. Please comment. Please enjoy. Thanks. UPDATE FEB 24, 2019: This system is defunct. Please read this post below for more info. UPDATE MAR 17, 2019: We're back on Dark Sky. Github has been updated with the new system and instructions. You really do make all the shiny things. Request: Please tweak code to be sunny all the time (except between the hours of 3am and 6am, when it can rain so human life might be sustained) IRL. @VulgarKitten Just use SoCal instead of Forks. Done -- except for the raining ever thing. Reminds me of the code I had on Angelic Layer MUSH. I had a CRON running that'd store data into SQL after grabbing from weather underground. As Angelic Layer MUSH was 2 years behind real-world, and weather underground had historical METAR data, I could grab stuff form the Tokyo Airport. Don't think they had an API at the time. And just reading their pages was a bit annoying. Damn right it was a PITA. But hey, it taught me Regular Expressions, so... win/win? If anyone hasn't checked this out and wants to, I'd like to highlight my absolute favorite feature: It calculates moon phase and calculates if the moon is visible (via moonrise and moonset). Super important when looking up to see the full moon! I'm currently working out the math to report on tides, including the high/low chart and the current height. This is, er, interesting because it involves sea-level estimates. If there is something more complex than the exact moon phase, it's tides. My desire to see a Pirate Mu* drove me to this. While I'm armpit-deep in the weather system code, is there anything that people wished was in weather code but wasn't? I'm planning a weather() function to this, since why not, but what else might anyone want? I can't recall, but how much data was available to you from the API? Like, I know we have "next day", but do we have a multiple day forecast? @Thenomain So make a 10-day forecast version! It is currently 78°, with a high of 82° and low of 52°. It is raining. The moon is full, but not visible. Weather Underground has been purchased by The Weather Company, and while I'll miss Wunderground it's nice that they have a pay-out for all their efforts. They were called Weather Underground because they were taking the information available for free via NOAA and presenting it to everyone on this young system called "The Internet", and not asking for money. It was a passion project that grew up, and now it's passed on into the great beyond of Things Getting Bought Out. The bad news is that they no longer have a "free" (probably supposed to be short-term) demo API that did everything we needed to do, and more. Current conditions, forecast, tide information, moon and sun information, it was amazing what information they would give out. This means that this system is now defunct. The missing information that I could get from just one call from Wunderground is tide estimates. This is not critical for most games, but damn I kind of want it now that I don't have it. Sure, it took a lot of pushing from Echoes in the Mist, but anyone who wants live weather and live "is the moon visible? ", follow the directions at the original Github location at the first post in this thread. Very neat. You could do this on PennMUSH using the @http command without the PHP backend and news file interface. Having a structured programming language do the heavy lifting is well worth it, to me. Scraping a news file is trivial in comparison, and the only reason I scrape it is because I capture more information than I use. Clearly that book written in (checks) 1995. Wait, really? 1995? 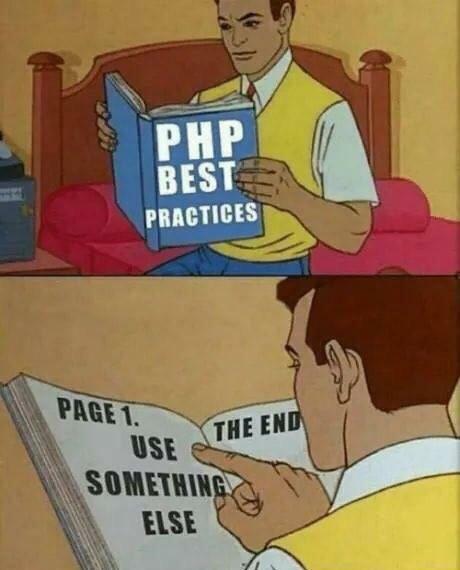 There's got to be an appendix containing languages PHP is better than.